Penthesilea, an Amazon who fought at Troy. 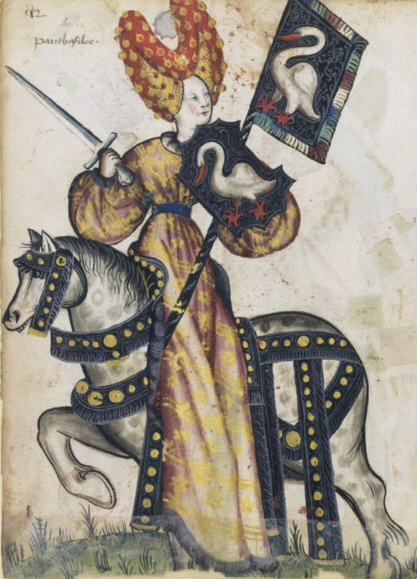 Anonymous medieval illustration. If you’ve read the books you might notice that this scene doesn’t happen like this, and some of the details are wrong, and also that this scene happens about a quarter of the way into The King’s Name or well over two-thirds of the way through the story. But all the same, this is where I started with the whole thing, with Sulien’s voice at that point, with the person who had been a knight for the fun of it and was now a responsible grown-up coming back to fight because it was important, and this time understanding what she was doing. It was the “she” in that, which was as inherent to the character as everything else, that made me make a world and write 300,000 words of it rather than just slot the poem in somewhere to history. Women have fought all through history, but almost always as exceptions, because they wanted to. There isn’t anywhere in history it was a feudal obligation in the way it was in this poem. So I made up the world and wrote the books to give this scene somewhere to happen. Incidentally, when I wrote this I knew precisely what they were fighting for (the Peace, in all the implication of the book) but not the faintest idea who they were fighting against. I had to figure all that out later. Who trust in me, as I do trust to thee. Yes, thirty lives I place between thy hands. I pledged myself, my single sword, to thee. That thou shouldst keep me as I did deserve. At arms and on the field: thou knowst thy craft. For glory and renown, for flashing steel. Before my father’s fall, my brother’s wound. Not now my life alone, not this time, lord. My fighting-folk in times of good or ill.
To bring them safely home, as I shall not. Nor lives set in my hand I must protect. Are risk of other kind, requiring cause. For those who fall, and those who limp away. For youthful dreams of glory or of skill. The hungry winter, and the homes destroyed. And all the Peace we built so long forgot. And count each one of us thou lose a loss. We shall withstand this foe and win the day. That we have forged from such strong links as this.